There’s no doubt that hydrangeas can hold their own in the garden. With big colorful blooms and beautiful green foliage, summer’s favorite flower makes a bold statement in any garden. But, why not pair them with delicate foliage, bold flowers or subtle ornamental grasses for more variety? If you’re looking for ways to make your hydrangeas pop even more, try these companion planting tips. When planting hydrangeas, be sure to use Espoma’s Bio-tone Starter Plus for best results. It’s hard to go wrong when choosing a color for companion plants. Try pairing hydrangeas with foliage in different hues of the same color. 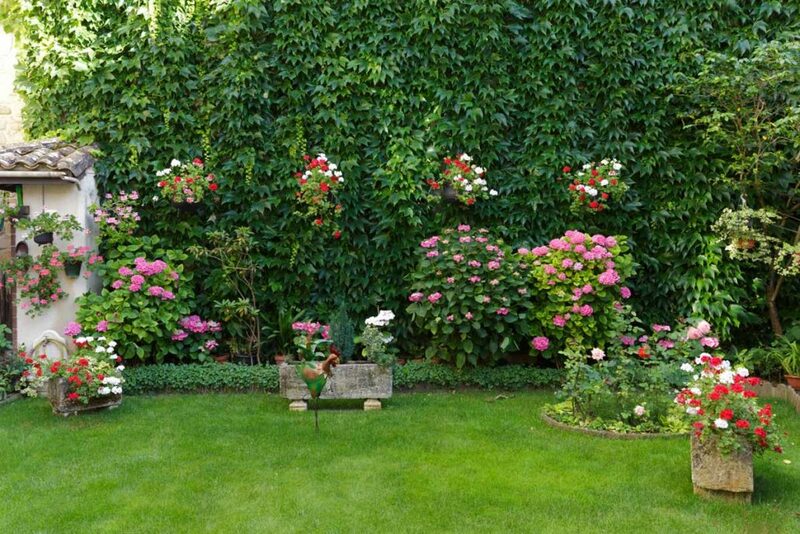 This adds subtle dimension and almost creates a 3-D effect in the garden. If your hydrangeas are pink, pair them with Rose Glow Barberry shrubs. The deep pink and purple foliage emphasizes the pastel pink flowers and contrasts perfectly with the green leaves. Try planting Blue Star Juniper alongside blue hydrangeas for a beautiful display. This low-maintenance shrub provides beautiful bluish-green foliage that complements any blue flowering plants. When planting flowers with flowers, timing is everything. Be sure to choose a summer blooming flower that will blossom around the same time as your hydrangea. You can choose to plant similar hues or bright contrasting colors. If you’re looking to create a dramatic contrast in the garden, choose a flower that comes in a variety of colors. Begonias and geraniums are beautiful flowers that come in many different shades, making them a perfect companion for hydrangeas. Create a colorful rainbow garden by pairing blue hydrangeas with pink geraniums or white hydrangeas with scarlet begonias. If you want the focus of your garden to be mainly on hydrangeas, opt for more subtle ornamental grasses that simply enhance their beauty. Most ornamental grasses are low-maintenance and easy to grow, giving you more time to spend perfecting your hydrangeas. Fountain grass is one of our favorites because it provides pretty feathered plumes that dance in the wind. Green and yellow Japanese forest grass also complements hydrangeas very nicely. Let us know what you’ll be planting with your hydrangeas this summer! And watch this video on planting hydrangeas. Is that backdrop Boston Ivy?